None of us, not one single one of us, has attained whatever success we have by ourselves. We have all been helped along the way by parents, teachers, friends, spouses, children, co-workers, and even strangers. Yes, as individuals we had to apply ourselves, take advantage of opportunities and work hard, but along the way, there were many who helped pave the path for us to walk on, who gave us help when we most needed it, who unselfishly made a difference in our lives. 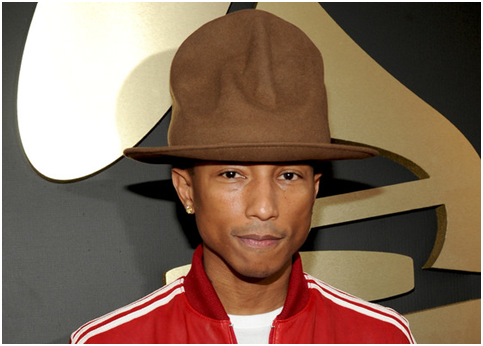 Pharrell Williams, singer/songwriter of the mega-hit, “Happy”, was recently interviewed on CBS Sunday Morning. His humility and sense of gratitude for those who helped him build the foundation for his success, is evident. Give yourself a treat and watch the video of his song, “Happy”. It will make you happy!! Now, go thank three people who have supported you in your life. Call them, write a note, send them a prayer, or go and see them. Write their names down right now and do it today. Then . . . support someone else. I’m going to talk to you straight. I won’t mince words and I’m going to tell it like it is. First of all none of us is entitled to have a great life. Yet, one of the most pervasive myths in America today is that someone else is responsible for making me happy, making sure I have fulfilling, nurturing relationships, succeed in my job and have the home of my dreams. Not true. In fact, the one and only person who is responsible for the quality of your life is YOU. If you want to be successful, you have to take 100% responsibility and accountability for everything you experience in life – your achievements and failures, the quality of all your relationships, your health, physical fitness, weight, income, where you live, how you live, your debts, your work experience – all of it. This isn’t easy. In fact most of us have been conditioned to blame everyone and everything outside of ourselves for the results that show up in our lives. We blame our parents, our children, our bosses, our co-workers, our friends, enemies, the weather, the government, the economy, the banks, our spouse, bad luck, our astrological chart, our lack of education. But results don’t lie. They are the clearest indicator of the choices you have been making in your life. Let’s face it, how many times do we say the government makes me pay taxes, my boss made me work overtime, the weather made me drive slowly? Or I have to pay my bills, go to work, drive my kids, cook, clean, mow the lawn. We blame others and outside circumstances and we begin to feel victimized. When in fact none of this is true. You don’t have to pay taxes or your bills. You don’t have to drive slowly or cook, clean and mow. You do it because you prefer that to the alternative. All of which means you are making a choice. No one is making it for you. You are making the choice. Your choices to any situation produce your results. You have to give up explaining . . . If you want the life of your dreams, then you’re going to have to take 100% responsibility for your life as well. This means you have to give up all your victim stories, all your blaming of others and explaining your circumstances. You have to give up all the reasons why you don’t have what you want and all the “ya buts” and excuses. You have to give all of this up FOREVER. You must realize you have always had the power to make the choices that would lead to the desired result, but for whatever reason, lack of awareness, fear, the need to be right, wanting to make someone else wrong, the need to feel safe, or to look slick and cool – whatever – it was your choice to not exercise that power. Who knows why? It really doesn’t matter. It’s the past. All that matters from this moment on is that you recognize the power to choose your actions, reactions and inactions is completely in your hands. No one is making you. No one is forcing you. You are making the choice. You have to give up complaining . . .
First of all, let’s take a look at why we complain. We do it because we think there’s something better than what we’ve got. Then we resist and fight back. We pretend we didn’t have anything to do with setting up the situation to be the way that it is. Somehow, you think that just complaining will do something about it. If you didn’t think it could change, you wouldn’t complain about it. But if you notice, complaining does absolutely nothing! You have to give up blaming . . .
You can blame outside circumstances, the weather, the economy, your relationship, the government. You can blame the lack of resources, lack of time, lack of money. You can blame others for not understanding, caring or wanting to listen. No doubt all of these factors may exist. But they are not the deciding factors. If they were the deciding factors, then no one would succeed. But that’s not the case. Barak Obama became President, Susan Boyle brought the house down in Britian’s Got Talent, two young college students created a company called Google, and a 40 yr. old swimmer won 3 medals in the Olympics. For every reason why it’s not possible, there are hundreds of people who have faced the same circumstances you are in and succeeded. Lots of people overcome limiting factors, so it can’t be the limiting factors that stop you. It’s not the external circumstances and conditions that stop you. It’s you. We think limiting thoughts and engage in self-defeating behaviors. We defend our self destructive habits like drinking and smoking, we ignore useful feedback, we ignore warning signs and signals, eat unhealthy food, fail to exercise, spend more money than we have, fail to face the truth, pretend we have nothing to do with it, refuse to confront difficult situations, choose to avoid and ignore, don’t ask for what we want and then wonder why our lives don’t work. You aren’t alone. Most people do this. They have an excuse for everything and frequently feel like a victim. We are all stimulus response machines and go on automatic behavior. Your kids do something wrong, you yell. Your boss is withdrawn and you think you’ve done something wrong. The traffic is backed up and you get exasperated. It rains when you have planned a picnic and you get upset. We get stuck in our conditioned responses. We think things are beyond our control, but that’s not true. We are very capable of regaining control of our thoughts, images, interpretations and behaviors. So from this point on, everything you think, say and do needs to become intentional and aligned with your purpose, your values and your goals. Everything you experience today is a result of choices you have made in the past. Example. . .
You may not have control over all the circumstances in your life, but you always have control over how you interpret (or how you think about) those circumstances and the manner in which you respond to them (your actions – your behavior). If you don’t like the results (what you’re producing or what you’re experiencing), then you must change your responses. Change how you think about something. Change your habits. Change your beliefs. Change your behaviors. Change what you read, what you eat, who you associate with. Because if you keep doing what you’re doing, you’ll continue to have what you have. If you are an alcoholic and you keep drinking, your life isn’t going to get any better. If you have received a warning about being late for work and you keep doing the same things that make you late, then you are going to lose your job. If you keep fighting in your relationship and don’t make amends and change the manner in which you communicate, then guess what, your relationship isn’t going to get any better. If you’re going to be a success, you must stop complaining, explaining and blaming. You must acknowledge the truth. It is you who took the actions, thought the thoughts, created the feelings, said the words, and made the choices that got you to where you are today. You are the one who ate the chocolate cake. You are the one who didn’t say no. You are the one who took the job, stayed on the job, married the guy, chose to drive on the highway, believed them, bought it, used it, ignored it, decided you had to do it alone, yelled at him, trusted her, decided to have children. The day you change your responses and take full ownership for your actions, reactions and inactions, is the day your life will improve. Thank you to my friend, Molly Gamble, for sharing the quote. Thank you to Jack Canfield for much of this content. About once a year I pass on information about other programs that I think may be useful for you. 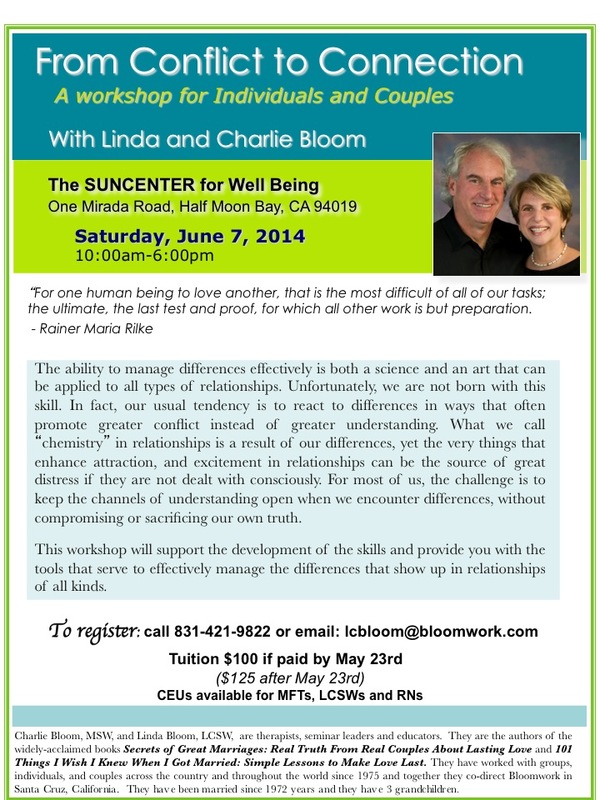 I personally know Charlie and Linda and consider them to be superb trainers. I am confident that anything they do will be excellent. You may want to look into this one coming up. This got me to thinking, what would I say? Perhaps you’ll find this to be fun, too. Play around with this and write down your thoughts. Good for family fun, a way to lighten up a meeting or a party guessing game. Please send your good ones on to me. I’d love to hear them! 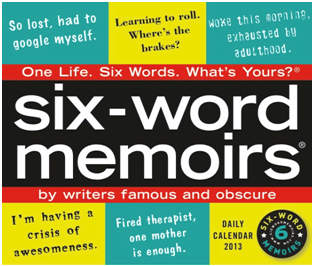 6 word Memoir: Write your life story in 6 words. No more, no less, just six words. It can be funny, silly, deep, light, poignant, vulnerable, whatever you want, whatever captures you and your life. You may have several you like or maybe find one today and change it tomorrow. Give it a go . . . Being a monk stunk. Better gay. Made first million mistakes before 30. I don’t know where we’re going. I’d rather be ashes than dust. I can’t keep my own secrets. Unexpectedly, however belatedly, accepted at last! Lived like no tomorrow; tomorrow came. Small fish in a big pond. Play to beat your high score. Made others laugh. I still hurt. Saving cents to save my sense. I need to think about it. Found love. Married someone else. Quiet late bloomer, still quietly blooming. Took everything in. Relished simple pleasures. Helping others, but who helps me? He promised me he loved me. Cyclist seeking sky. Found family, friends. Miss you, Dad. You’d be proud. Always felt better in New York. Love my dog. He loves me. Born looking up at the stars. Wasn’t noticed so I painted trains. I pray to thank, not get. Broken home, broken heart, new beginnings. Life’s too short to not tease. Life’s too short. Make some music. Born a Loser, Die a Legend. Taken but loved by different families. Life-long friends. Always be there. I still make coffee for two. Macular degeneration. Didn’t see that coming. Might as well eat that cookie. And don’t forget . . . send me yours! BTW – Mine today is: Live, love, laugh. Trust the process. This week’s WoW is simple.